NEW YORK, NY (AUGUST 7. 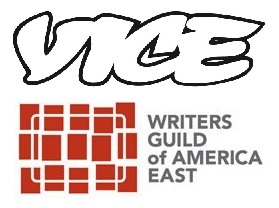 2015) – The editorial staff of VICE Media’s digital operations are now represented by the Writers Guild of America, East (WGAE). The staff sent a letter to Founder and CEO Shane Smith and his executives requesting that the company recognize their decision to unionize, and management agreed without hesitation. The parties intend to begin the process of negotiating a collective bargaining agreement shortly.